Bardney airfield was home to 9 Squadron’s Lancaster Bombers, arriving from Waddington on 14 April 1943 and staying for the duration of the war. 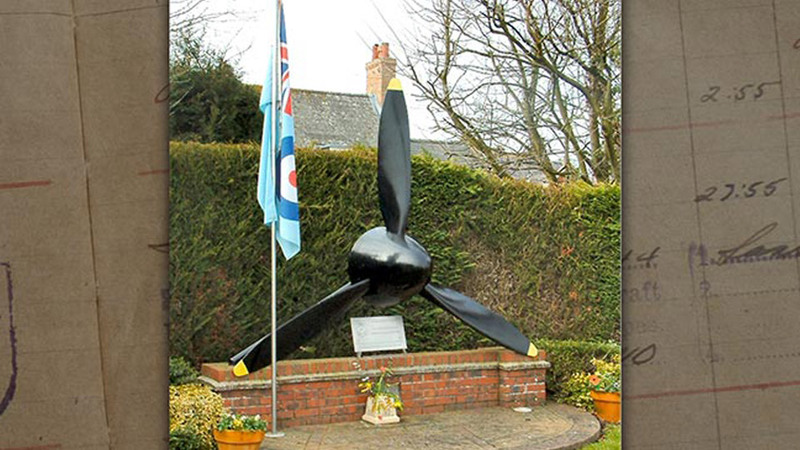 On 7th October 1944, 9 Squadron’s ‘A’ Flight was used to reform 227 Squadron which stayed at Bardney until 12 October 1944, when it was relocated to Balderton, Nottinghamshire. In November 1944, 9 Squadron joined 617 Squadron at RAF Lossiemouth, Scotland. From here on 12 November 1944, armed with 12,000 lb Talboy bombs, they took part in Operation Catachism – the successful attack on the German battleship Tirpitz in Tromso Fjord, Norway. The Tirpitz was struck by two bombs and capsized. Towards the end of the war Bardney though disused, was retained by the RAF into the 1960′s as a base for Thor Medium Range Ballistic Missiles. The airfield is still visible today, particularly from the air, where rows of modern chicken sheds mark the runways. Some technical site buildings still exist, including the hangars and watch office (used as a clubhouse for a model aircraft flying club).